Entering the world of antique Persian rugs is a unique journey. Exploring this world reveals hidden histories and ancient traditions passed down for thousands of years and transported across cultures. In the antique Persian rug world, the mundane becomes the mysterious: flowers and geometric figures are imbued with deep symbolism, and colors and shape carry deep meaning.The term “Antique Persian Rugs” refers to those rugs that were made in modern day Iran making the term “Antique Iranian Rugs” practically interchangeable. The international trade of traditional carpets and Persian rugs established thousands of years ago has resulted in a fascinating interchange of designs between East and West. Although antique rugs are one-of-a-kind works of art and luxury design pieces that make a house feel like a comfortable home, each Persian carpet also contains its own story. Each Persian rug completes the intricate history of all rugs woven before and since. In terms of universal decorative appeal, authentic Persian rugs, as far as their impact on home design, are unbeatable. 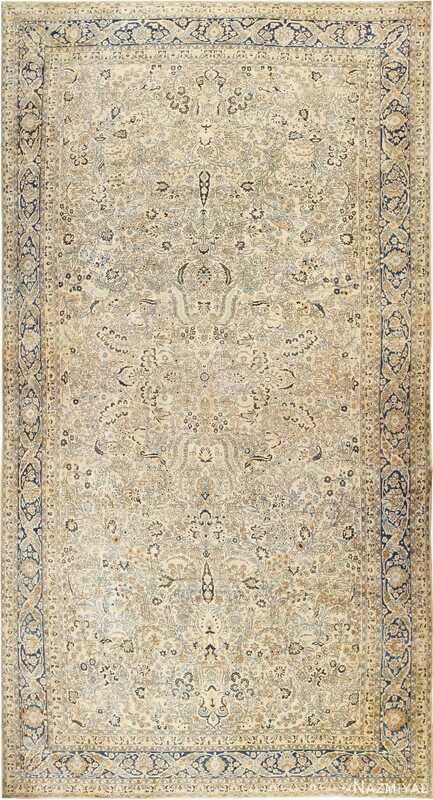 These remarkable show rugs and carpets have a timeless, classical elegance that’s right at home in Western interiors. For centuries, hand woven Persian rugs with their elaborate patterns have been the gold standard in traditional rug design. The handsome colors, lush botanical figures and tasteful embellishments are carefully balanced according to long-standing rules. Designs featured in antique Persian rugs are prized for their flawless proportions, effortless fluidity and timeless style. Ancient geometric principles that dictate form, proportion and the angles of spiraling curves are followed strictly without seeming stiff, rigid or uninspired. Even today, antique and vintage Persian carpets are prized for their durability, sumptuous textures and strong colors, but the lavish botanical designs and perfectly proportioned patterns are the true secret behind their eternal popularity and ageless elegance. In Persia, the largest carpet producing centers that flourished were in Tabriz (1500-1550), Herat (1525-1650), Kashan (1525-1650) and Kerman (1600-1650). Perhaps the most important cultural contribution to the world of art that was given by the people of Persia is the Persian Rug. These rugs are those that were woven in Persia (modern day Iran). For a Persian rug to be considered “antique”, it would have to be at least 80 years old. These rugs represent some of the very finest examples of textile art to ever be produced. The complex methods and high-quality materials used, ensured that each piece was a beautiful and unique work of art. Natural dyes, silk, cotton and/or wool yarn were used extensively. Woven by hand, each piece (of the antique rugs) was like no other and weavers dedication would ensure that their creations would last for decades, and in many cases, centuries. Historically, nomads, clerics and kings alike utilized the rugs from Persia as floor coverings and decorations. 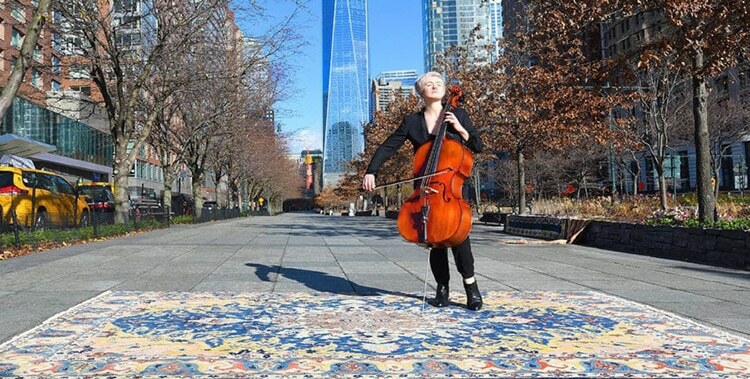 Today, these carpets are appreciated as artworks as well as investment worthy pieces. They are also appreciated around the world for their fine quality of weave, beautiful colors and artistic patterns. Simply standing in the same room as a genuine antique Persian rug can be a powerful experience. These gorgeous works of art have the unique ability to instantly transport the onlooker through time and space. Their presence takes us on an exhilarating journey to the exotic, faraway lands, of bygone eras. These rugs have an essence to them that is truly one of a kind. Persia, now modern day Iran, was an ancient and powerful empire which stretched from Africa to India. During the Safavid period, (the time period between 1500 and 1736 A.D.) was considered by many to be its artistic pinnacle, similar to the European renaissance. The modern day cities of Tabriz, Kerman, Herat and Isfahan became major producers of fine carpets. The ruling class at the time, referred to as the Safavid Dynasty, encouraged arts of many kinds, including paintings, calligraphy and intricate weaving. Hand-made rugs with intricate designs inspired by Persian culture were so well crafted and cherished, that many have survived for hundreds of years. Passed down from generation to generation, these rugs have become a living history. Evidence of a rich heritage and culture, each antique Persian rug has its own story. During the 16th century these carpets were exported to aristocratic and high-end consumers from all over the world. During the 1850’s, the biggest consumers were the European countries like England and Germany. These countries encouraged the development of additional rug producing factories in the major cities of Tabriz, Kerman, Mashed and Sultanabad. Because of this, the ruler at the time, Reza Shah Pahlavi, built royal carpet and rug factories to produce the highest quality rugs in the region. The construction of Persian rugs varies based on the city, region or village where they were woven. The “traditional” Persian carpet is tied with a single looping knot, known as Persian or Senneh knot. The vertical strand of thread in a Persian carpet has one loop. This use of a single knot is essential in establishing the identity of the place where the rug was made and can sometimes help in identifying the artisans who made it. When comparing carpets, the way to identify the knot used is to splay open the pile by bending the rug against itself and looking at the base of the knot. The design of a rug can be misleading. Some rugs may feature a ‘Persian design’ but were woven elsewhere. An example of this convention would be Indo-Persian rugs. These rugs were woven in India with Persian design and construction elements. Surprisingly enough, despite the tribal wars, migrations, commercial influence and rebellions – the methods of rug construction used by different cultures has changed very little over time. Many of the older Persian carpets from Tabriz have a central medallion, quartered corner medallions appearing over a field of scrolling vine ornaments, accented with single animals or birds, animal combat scenes and mounted hunters. Carpet grounds were red, blue and sometimes white but colors tended to be muted, partly because the sheep in the Northwest have coarse wool but mainly because of the salt quality of the water used in the dyeing process. Persian rug patterns are recognizable to the trained eye and have existed for many generations. When did the carpet production in Persia begin? 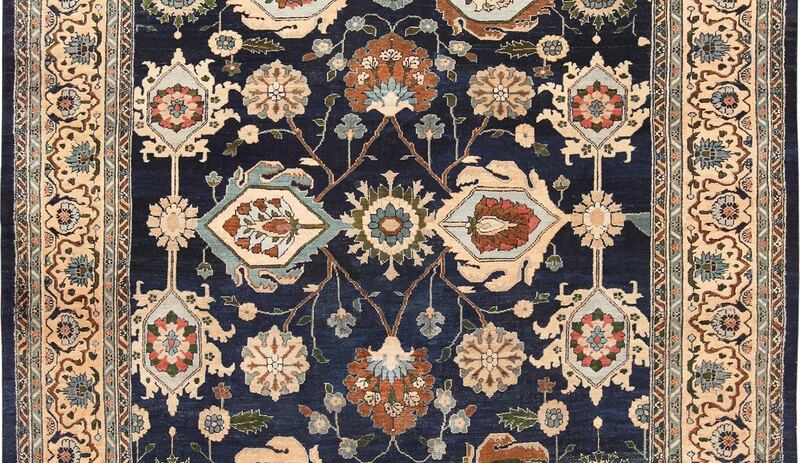 Among the carpet producing regions of the Middle East, none is as varied and extensive in its output as Persia. 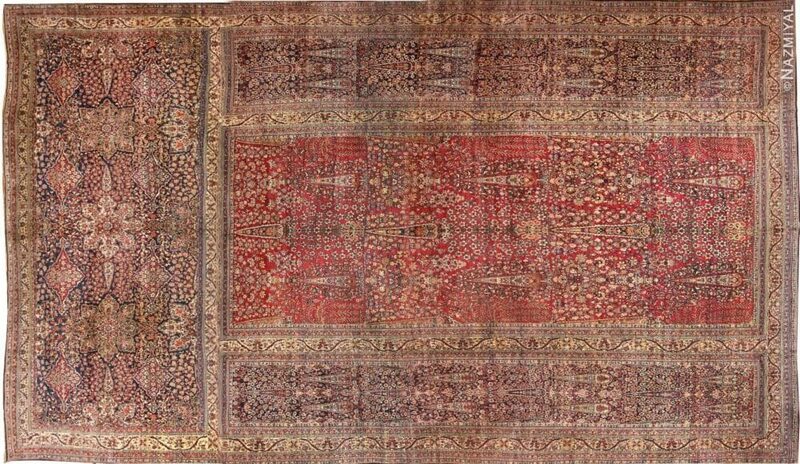 It is possible that fragments of 9th century pile carpets discovered at Fostat near Cairo were imported from what is today the country of Iran. There is evidence that carpet weaving in Iran really began during the Mongol or Ilkhanid period c. 1300, as well as for the subsequent Timurid period up through the late 15th century. Major centers of production took place (and some still are) in the cities of Tabriz, Kerman, and Isfahan. That said, there is no firm historical documentation for attributing carpets to the last site during the early years of rug production. However, the “golden area” of Persian carpet weaving really began after 1500 with the foundation of the Safavid dynasty by Shah Ismail. During the 16th and 17th centuries, Persia produced many of the great masterpiece carpets that are still in existence today. During these periods Persian carpets were exported all over the world, from Japan to Western Europe. It is perhaps as significant that the lavish carpets captured, as booty, from the Ottoman Turks, after the Battle of Vienna in 1683, consisted primarily of Persian rugs… even though the Turks were themselves major producers of hand knotted pile carpets. What would be considered the peak of the Persian carpet production? 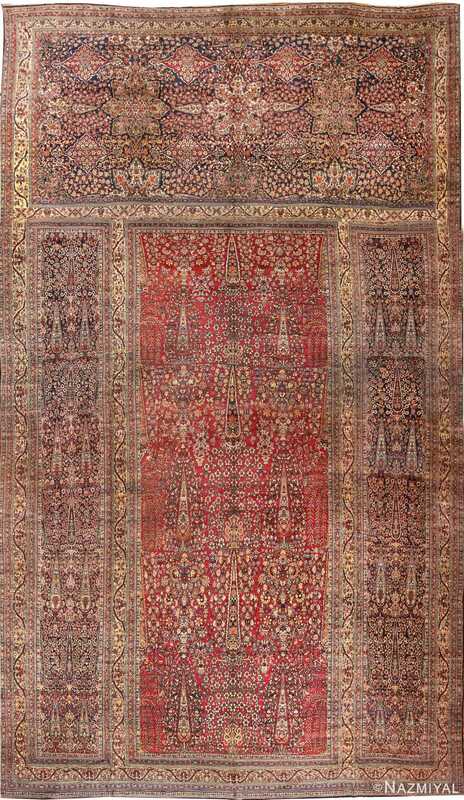 The carpet production in Persia peaked during the late 19th century. By this time, these carpets had become virtually synonymous with the concept of the “Oriental rug”. During this time, the Persian rug weavers recaptured much of the range and quality of their predecessors. This holds true for both the older weaving centers like Tabriz and Kerman, as well as in many new areas of production like Sultanabad or Kashan. Since that time, Persian carpets have been made in an almost dizzying array of styles from the finest urban productions to the boldest village and nomadic pieces. 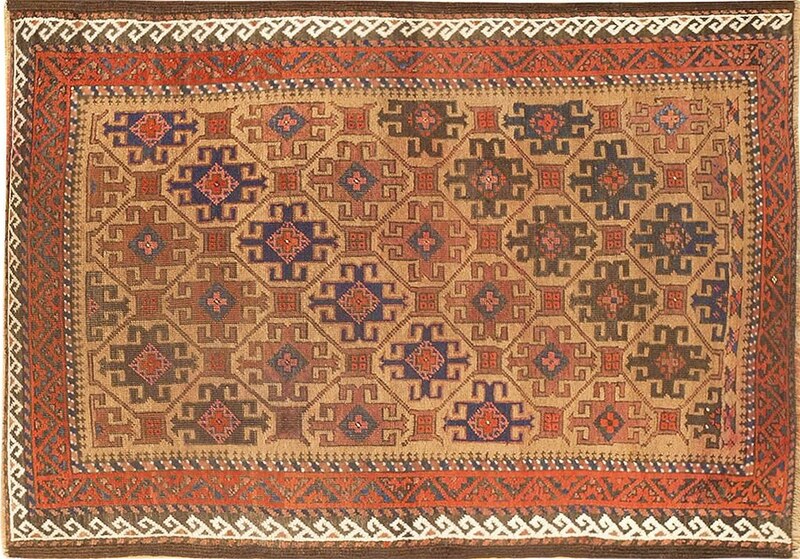 In the Caucasus, the bottleneck of rug weaving traditions intensified as displaced ethnic groups from Romania, Armenia, Azerbaijan and Russia shared cross-cultural designs that were transported north to Eastern Europe.With various points of entry, including longstanding Viking trade routes, through the harsh Arctic Sea, these carpets as well as the actual weaving techniques thrived throughout Europe, Scandinavia and Great Britain. 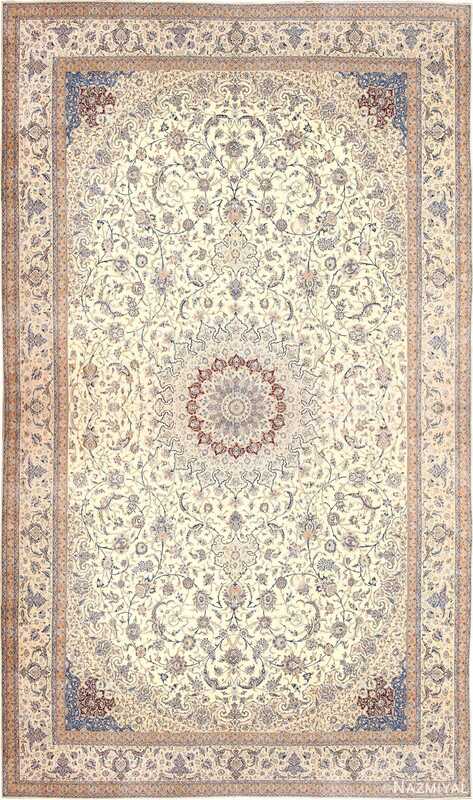 What is considered the most famous carpet from Persia? As many authorities believe, the most famous Persian carpets came from Tabriz and are referred to as the twin Ardabil carpets. These carpets are in the permanent collections of the Victoria & Albert Museum and the Los Angeles Country Museum. What are some of the best styles and types of Persian carpets? Mohtashem Kashan rugs are characteristically known for their purple or less often ruby red silk bindings used for the selvages and pretty much all were woven using blue wefts. These are the most highly regarded of all the Kashan weavings. 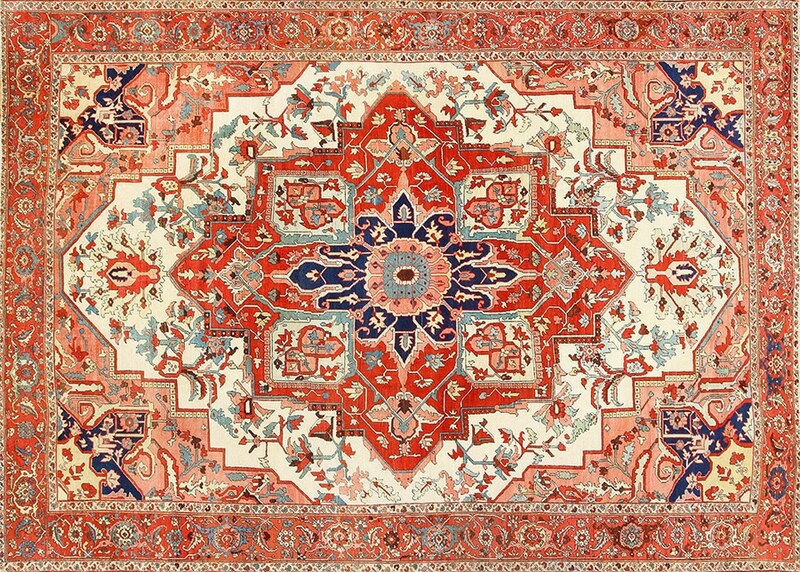 Kerman carpets, have a unique structure called the ‘vase technique’. The earliest examples, especially the vase carpets, have been escalating in value and interest at an unbelievable rate. Garden carpets, (ornamented with formal gardens and water channel) and ogival lattice carpets are examples of this technique. Designs of fantastic complexity were executed. Are all Persian rug designs essentially the same or do they vary? 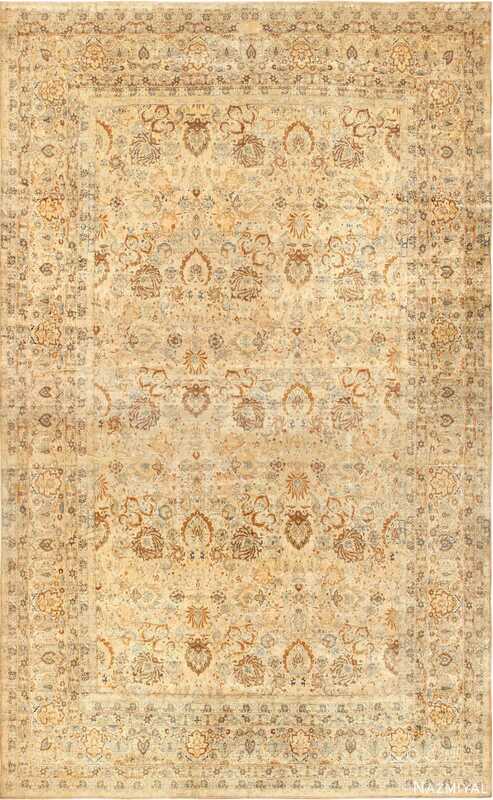 Overall, Persian rugs are among the most diverse and beautifully designed of all antique Oriental rugs. The rich story of the cultural and historical background of Persian rugs is one of the most interesting in all of art history. There is a Persian carpet out there for anyone who seeks one. That quest is sure to be an exciting and edifying experience. Another less known but interesting fact is the story of the 16th century Shah, named Humayan. During his 10 year exile, he happened upon two artists. When he returned to India and regained power, he directed weavers to translate the painters’ style into rugs. 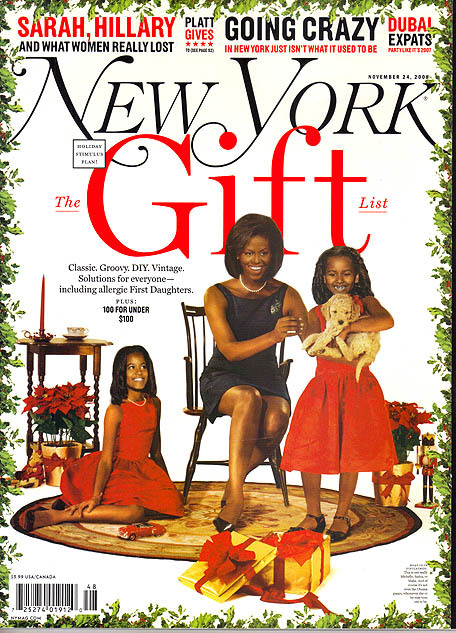 These rugs can still be found today. Their unique beauty and inherent history is a paradigm example of what makes antique Oriental rugs so valuable. What makes Persian Rugs so valuable? Aren’t there a lot of these carpets around? The number of antique Persian rugs will only decrease over time. This is one of the reasons why they are of such great value. While today there may be a lot of rugs available on the market, very few are considered by the trade to be “good examples”. As time goes on, less and less of the true antiques will survive. As the number decreases, the value will rise. Today we are in the midst of an escalating interest in these works of art. This is why the best and earliest examples have been consistently selling for, what would be considered, only a few years ago, unfathomable amounts (the record for the most expensive rug sold at auction is currently $34,000,000). Why have the designs in Persian carpets changed over time? As Western influence expanded across the Middle East throughout the 20th century, primary cultures began to lose their self defining attributes (since they began weaving based on the current market trends and demands). People’s abilities to sustain traditional crafting techniques faded and original motifs were slowly lost. The divide between antique carpets and all those that follow shows, over time, that the quality of these pieces diminished on all levels. Are the older rugs from Persia considered works of Art? There are few avenues in the art world that offer as much rich cultural and historical context as those found in the antique rugs from Persia. The rugs that were woven in Persia were literally woven with the aesthetic and cultural ideals of an entire people, and perhaps most importantly, rug-making was the art form that the people of Persia took more seriously than any other. The Persian people took much pride in the textile art they created. Thus, it is in the antique carpets from Persia that we find the very finest and the most important examples of Persian textile art in general. To know the Persian rugs is to know a people and a culture in a way that is rare in the art world. Persian Rugs are regarded as one of the highest levels of artistic sophistication accomplished by humankind. As such, designers, artists and rug collectors covet these masterpieces. There is no doubt that Persian rugs are among the most beautiful and enduring artistic creation ever crafted. The beauty and complexity of Persian carpets that are antique, is timeless, inspiring, exciting and edifying. Like the feeling of intimacy that one experiences when one sees the brush strokes in a painter’s finest work, so too does one feel a connection to the master rug-makers of Persia when one sees up close the meticulous weaves of a gorgeous rug. Persian carpets and rugs are a great treasure of humanity, and to know them as such is to know the limitless nature of fine art. Would Persian Master Weavers Sign Their Carpets? Sadly, most rugs, even those woven by master weavers, were not signed. A master weaver’s signature and method can help in determining where the carpet was made. It can also assist with what style the carpet exhibits, and naturally, who the weaver was. Urban cities have traditionally facilitated Persian rug weaving as a commercial industry. Any manufacturer’s production would have been greatly influenced by the market demands of the time. At the helms of such production companies were the master rug-weavers. These individuals were the ones who chose the colors and organized the weavers. These master weavers designed with a personal identity that superseded group identity. Therefore, in such instances, the vernacular craft gave way to conscious visual art form. Today these masterworks can be found in museum collections such as The Metropolitan Museum. They can also be found in the inventories of fine antique carpet galleries. Do the older Persian Rugs Make For a Wise Investment? In addition to being beautiful works of art, the best examples of Persian carpets have been collected throughout history. They are also collectible today by individuals as investments. Historically, the rugs from Persia have been referred to as ‘Iranian stocks and shares’. Iranian market places are full of underground vaults where businessmen keep their precious pieces. Persian carpets of museum quality would be considered on par with the investment potential of a master painting. That said, they are relatively less expensive and can serve a more practical use. Today, Persian carpets still remain a viable commodity. *Note: Relative to market demand, unless damaged, the best Persian rugs will not, for the most part, depreciate in value; therefore making them valuable investments. Prices will reflect and fluctuate with market demands. What do the names that dealers use for Persian carpets mean? With the introduction of varying cultures’ commodities and art (in all its varying forms) at the market place, came the inevitable copying and constant modifications of designs and motifs. The tribes or people that wove them. Example: Kurdish rugs are those rugs that were woven by Kurdish people. Since they were mostly nomadic, they are not assigned a specific city or region. The region (city, district, town, villages) in which they were crafted. 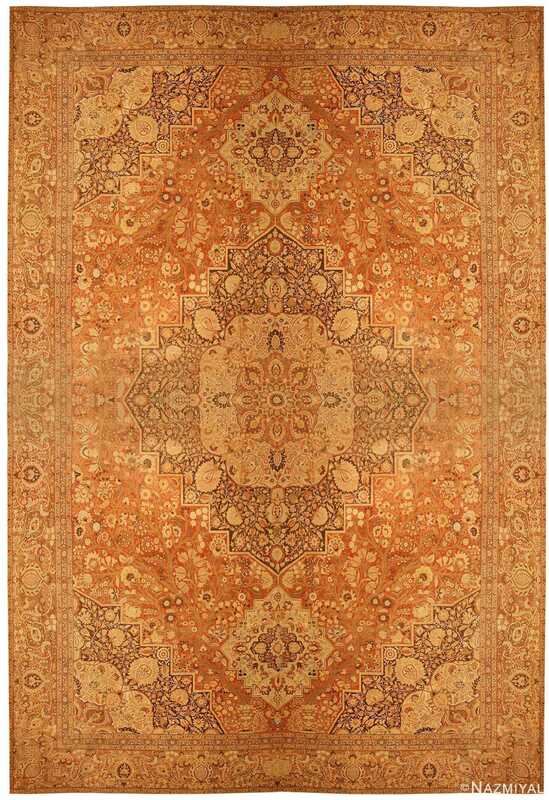 Example: Tabriz rugs are those rugs that were woven in the Persian city of Tabriz. In rare instances, the weaver’s name will be given to a specific production. 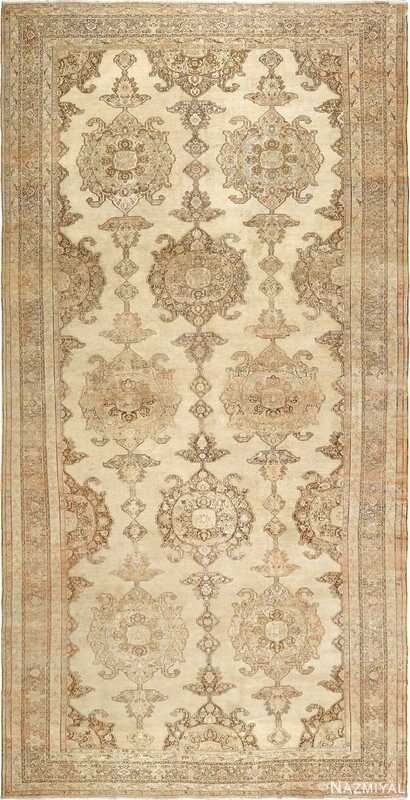 Example: Ziegler rugs were rugs that were designed and manufactured by Ziegler & Co. However, there are exceptions to this general rule, as is the case with Serapi Rugs. In this case, the term Serapi refers to the older and “better” rugs that were made in the city of Heriz. 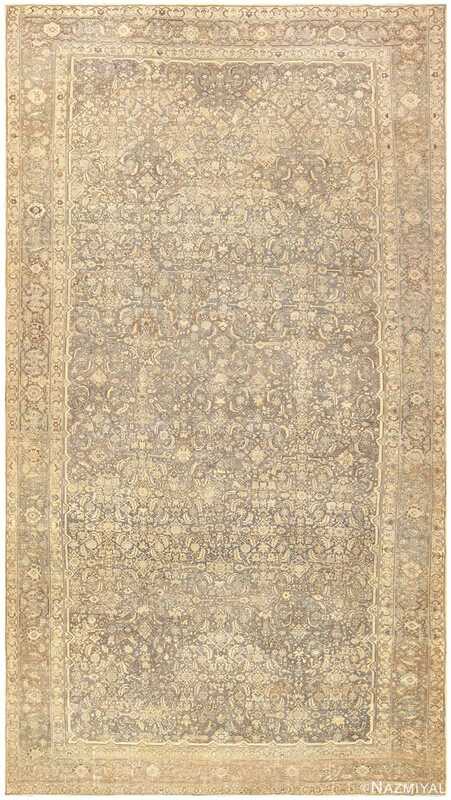 What dyes were used to make rugs in Persia? 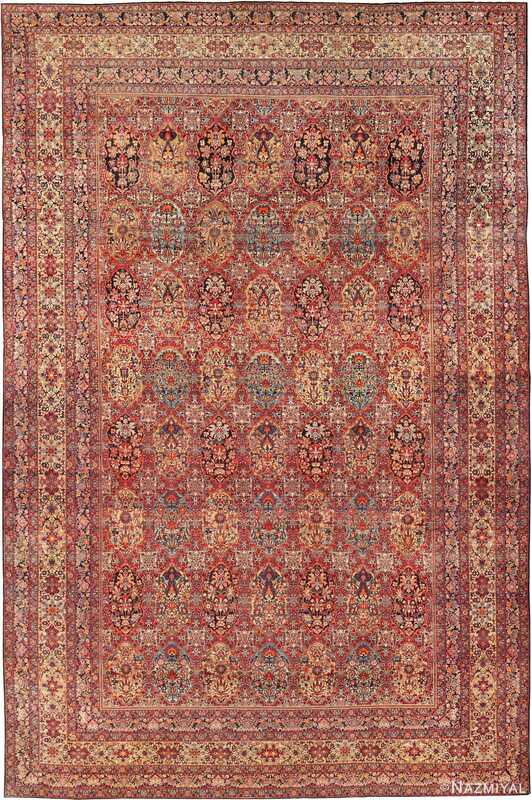 The rug color dyes used when weaving Persian rugs were generally natural. This served to create lustrous, animated works with great depth of field. The recipes used to dye the fibers were commonly comprised of berries, insects, minerals and seeds. The combinations were unique to each tribe, city and/or region. The weaving techniques they employed as well as the dye recipes were guarded as precious tribal secrets. 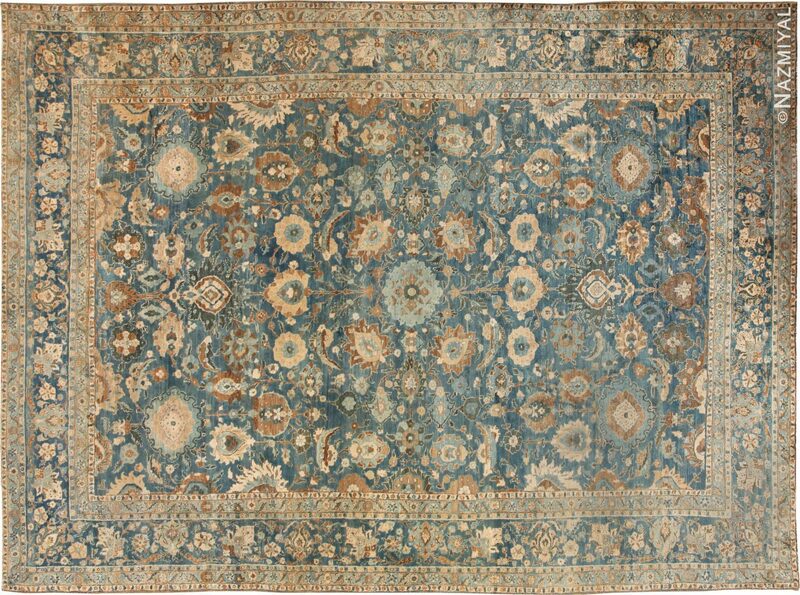 As a side note, the first chemical dyes were introduced to the rug markets during the mid 1800’s. Therefore, it is not uncommon to see such dyes in late 19th century rugs. Are the Persian rugs woven as a family business? Would the designs be passed down from generation to generation? Design styles were passed down through long lineages of craftsmen within a tribe or group. Family members wove alongside one another. Weaving first for the household then for the market.For the common designer, individual identity was not important. What was important, was to accurately execute the traditional style. 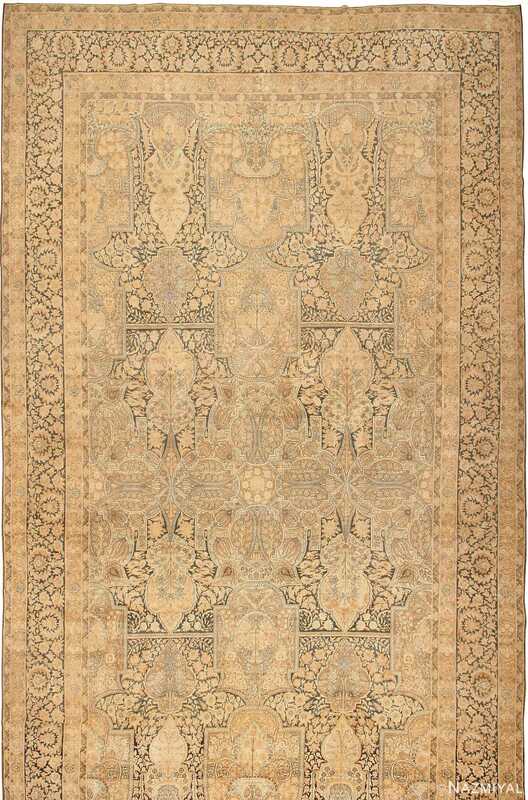 Thereby ascribing the signature patterns and motifs of the”tribe” to each carpet. Typically, a single carpet could take months and even years to create. The actual time depends on the size and quality of the carpet. 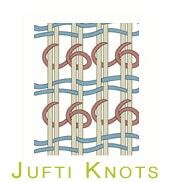 The finer the carpet, the more KPSI (knots per square inch) it has and therefore the longer it takes to create. This is often times why many people would work side by side on the same carpet. All of this partakes in the deep appeal and timeless quality of antique Persian carpets! What are the different Persian knotting techniques? The two most commonly used knots in Persian weaving are the Turkish (used in the Caucasus, some Turkish and Kurdish areas of Iran, Turkey and East Turkmenistan) and Persian knots (Turkey, Pakistan, Egypt, China and India). 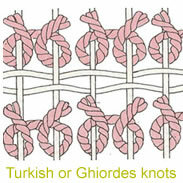 The Turkish knot is made by passing between two neighboring warps, looping under one, wrapped around both, then pulled through the center. Both ends will come out between the two warps. 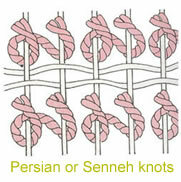 The Persian knot is commonly used when weaving finer rugs. Simply because it is generally a much smaller than its counterparts. Wrapping around one warp, then passing behind the neighboring warp so that it divides the two ends of yarn, makes the knot. Double Knotted: The second knot sits in front of the first knot. With the double knot technique, the second knot is not visible from the back. It is important to note that if a rug is machine made (including hand tufted), it is not a genuine antique Persian rug! Nomadic Tribal Persian Rugs – A certain mystery and romance attaches to the concept of the oriental rug, but perhaps the most romanticized objects of this kind are the so-called nomadic or tribal Persian rugs. What distinguishes Persian rugs of this type is first of all the social and economic basis behind them. They were produced by peoples whose identity were organized around various tribes and clans. Their economy was depended on domesticated livestock, especially sheep and goats, and style of life was that of a nomadic, tent-dwelling population that periodically had to move in search of grazing for its flocks, as opposed to a sedentary population based on agriculture. In Persia, the most well-known nomadic weavers are above all the Turkmen and Baluch tribes of the Northeast, the Khamseh, Afshar, Bakhtiari of the Southwest, and the Shahsavan of the Northwest Persia. In terms of Persian rug design, however, there is no single, unifying feature that one may define as nomadic. This does not include, of course, a taste for abstract geometric forms or highly geometric animal and floral rug motifs, a taste that is also typical of village weaving. The tribal nomadic Persian rug design repertory has often been claimed to be incredibly ancient, involving motifs that stem from the timeless tribal culture of its weavers. But like those of village weaving, the designs of nomadic rugs originated as highly abstracted versions of city rug designs of floral, animal, or geometric medallion type. They represent the creative artistic side of the normal economic relations existing between nomadic peoples and their sedentary village and urban neighbors. 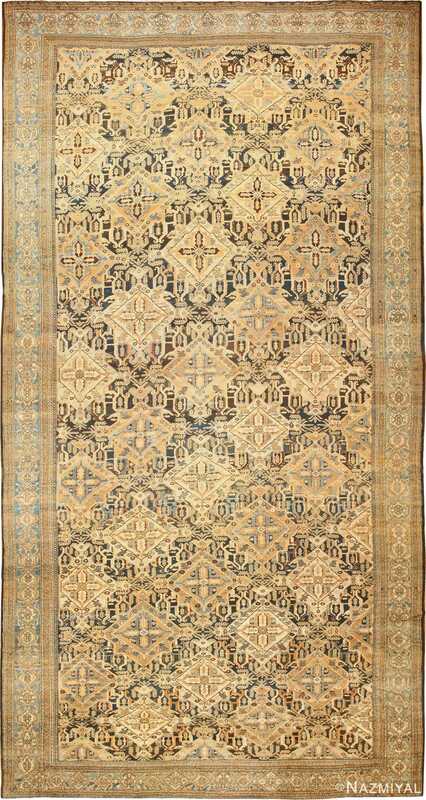 At times nomadic rugs, especially those of Turkmen, also adapted the much finer technique of urban Persian rug weaving, in contrast to the coarser weave found in most nomadic work. 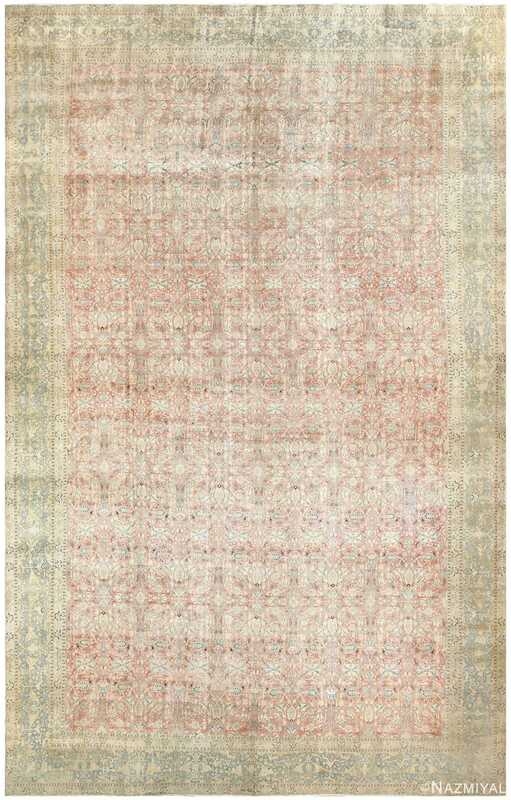 This contrasts notably with city and tribal village rug production, which utilizes spun cotton, a sedentary agricultural product, for the rug foundation since cotton enables a more consistent tension allowing for straighter, more perfectly rectangular weaving. 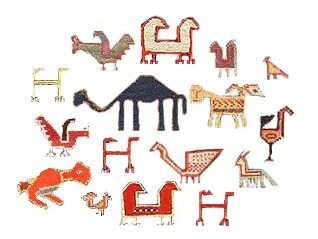 The format of nomadic rugs is also distinctive. They are not simply floor coverings, or at time cushions, of variable size like urban and village rugs. Instead they are also woven as storage bags, both large and small, hung on the tent walls or used on pack animals, effectively serving as nomadic equivalents of closets, cupboards, and chests or boxes. 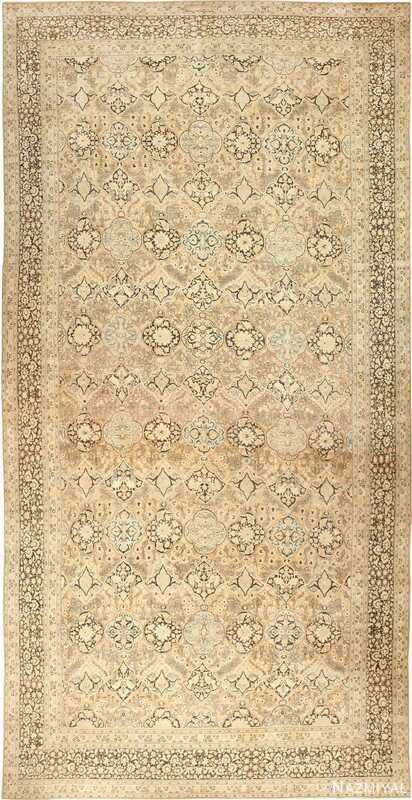 The older Persian rugs will mainly feature abstract pictures of geometric and/or floral shapes. This is a result of the fact that many of the Persian people are Muslim and Islam does not allow living beings to be duplicated through imagery and art. But what may seem like random shapes and abstract designs, are, for the most part, anything but! These rug patterns and designs have been passed on from one generation to another and many of these motifs have pretty profound meanings (such as lucky charms, wishes and messages). Who is the best dealer of Persian rugs? Naturally, we believe that Nazmiyal is the best dealer for Persian rugs. That said, we urge you to do your due diligence. 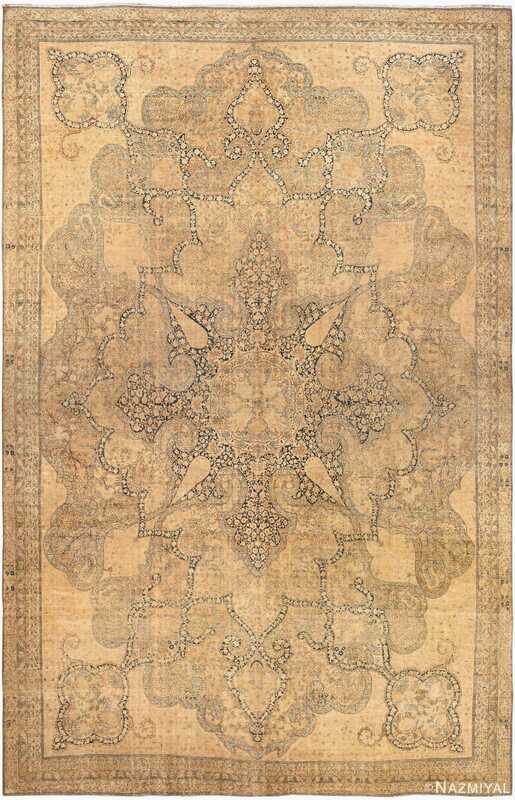 However, the more antique rug galleries people visit, the more educated they become and we believe that an educated consumer is the best buyer. Why decorate a home with Persian rugs? If someone wants to decorate the interior of their home or workplace, these rugs should be placed high on the list of items to purchase. The best antique Persian rugs are timeless. They fill a room with a beautiful combination of old world tradition and style. Many of the major taste makers as well as the biggest names in the field of interior design incorporate them into their projects. The rugs are a unique manifestation of the rich Persian culture and art which date back hundreds, if not thousands, of years to as far back as the Bronze Age. By incorporating these rugs in interior decor, they add color, depth and excitement. No room is complete without a beautiful piece on the floor! 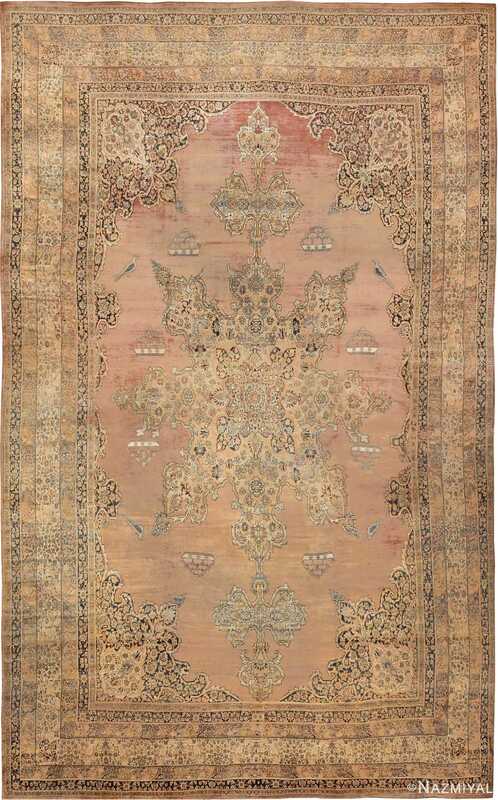 However, purchasing an antique Persian rug is much more than just a pretty decorative piece for the home. 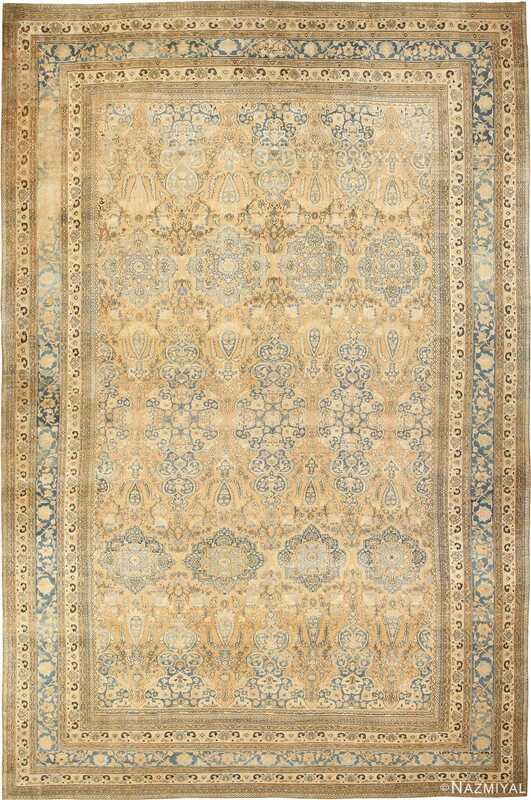 The better and more rare examples, offer great investment potential which usually grows as the rugs age. Needless to say, the rugs add a classy and an exquisite touch to any project. The delivery men have left. You’re standing alone in your apartment, hands on hips, brow furrowed. You look around the empty room and you ponder your next move. You notice how nicely the sunlight pours through the large window on the far wall, how nicely it lands on the floor. You nod to yourself, knowing that you’ve made the right choice, that this is the perfect room for it. But still you cannot help but feel intimidated by the task before you. It may seem difficult to do it justice, to place it properly, to arrange the furniture properly around it. After all, you’ve never owned anything quite like this. Your antique Persian rug is more than 80 years old (how old a piece has to be to be considered an antique rug) and beautifully done with a gorgeous design and brilliant colors. Knowing that this piece was hand-woven and dyed with natural ingredients, you know it is an impeccable masterpiece. And now it is your job to make sure that this beautiful piece of art can be appreciated by all who see it, and you are more than slightly apprehensive about the task before you. But relax – there’s no need to work yourself up over this seemingly daunting task. After all, decorating with antique rugs is a tradition as old as antique rugs themselves, and there is a wealth of information on the subject. For instance, it is an established rule of thumb that if you’re going to place your antique carpet on a nice floor, then it is more than acceptable to leave some space around the carpet. You can even use the carpet to define spaces – for instance, you might want to place a sofa on the carpet to create a living room space whose borders are articulated by the rug. Of course, that brings up the question of furniture placement, a potentially sticky wicket. But again, there are established do’s and do not’s. For example, your rug – which has an all-over, repetitive design – is perfect for furniture placement. If you find that your rug is too beautiful of a piece to totally cover with your large sofa, you should know that it is perfectly acceptable to place just the front two legs on the carpet. That way, you get to define your living room space with the carpet and the furniture without having to worry about obscuring the beauty of the piece. It is your personal taste and judgment that led to your purchase of this piece, and it is that same personal taste and judgment that should ultimately dictate the placement of the piece and the subsequent feel it brings to your room. So relax! At the end of the day, the beauty of the piece will speak for itself. You’ll be the envy of all who set eyes on it. Just remember to enjoy it and good things will follow! Many times we associate Persian rugs with magic carpet rides thanks to the likes of Disney blockbuster hits such as, Aladdin, Aladdin 2: Return of Jafar and Aladdin 3: The King of Thieves. Fortunately, you don’t have to search far and wide to find one of these magical treasures. Though it is not a guarantee that every Persian rug will make you an aviation specialist, it is a guarantee that one of these remarkable finds will bring your home true richness of historical quality. 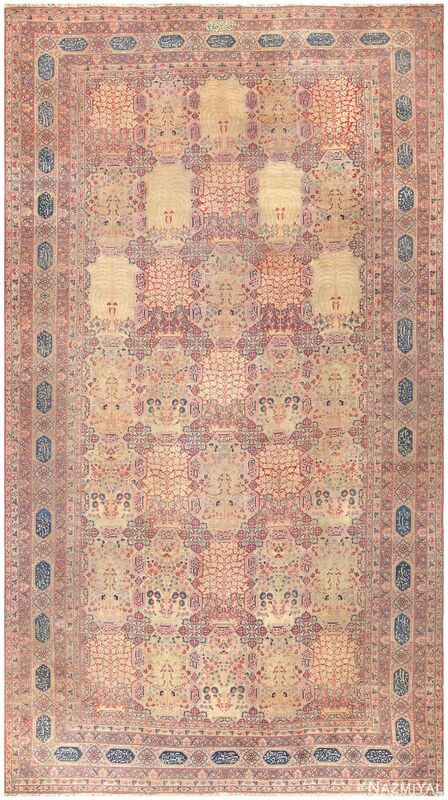 The Nazmiyal Collection has been a global leader in the antique carpet trade for the latter part of the century and into the new millennium. As such, the rugs offered are hand-picked to ensure the utmost quality and textiles enriched with history and tradition. Similar to our posts on Sultanabad rugs or Tabriz carpets, the Persian rug is a rare find of a gem to the home accent world. Yet, differs in its earlier historical relevance, making Persian rugs one of the most sought after textile in the rug industry. When one sees one of these rugs, there is a a journey into the majestic world of ancient civilizations over 2,500 years ago. Persian rugs are essential statement pieces for the true antique aficionado and connoisseur of crafty finds. 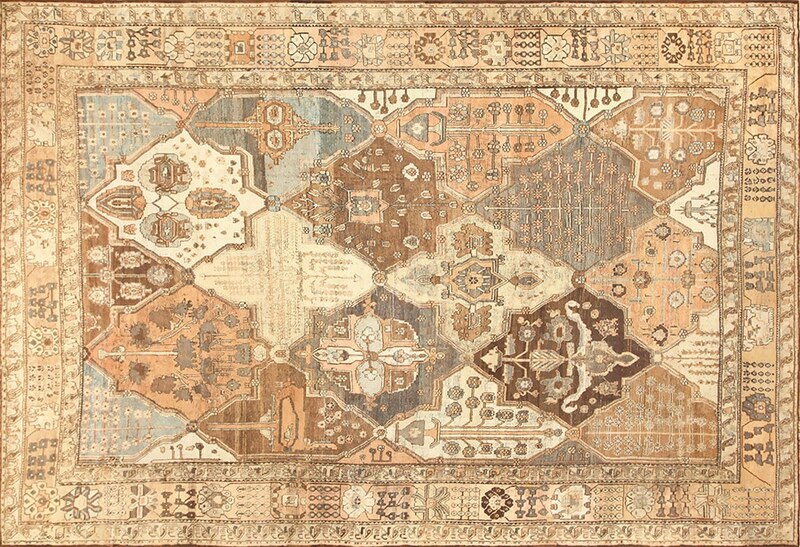 These treasures from the Orient are full of geometric shapes, floral designs, and bold color palettes that will best suit your home’s needs in order to create a den of true beauty and antique rug history. Whether you’re hanging a Persian rug as a decorative focal point on the wall or laying one down to enrich the ground in which you walk, these antique diamond finds will have you creating your own Middle Eastern getaway that your guests will truly be jealous of. 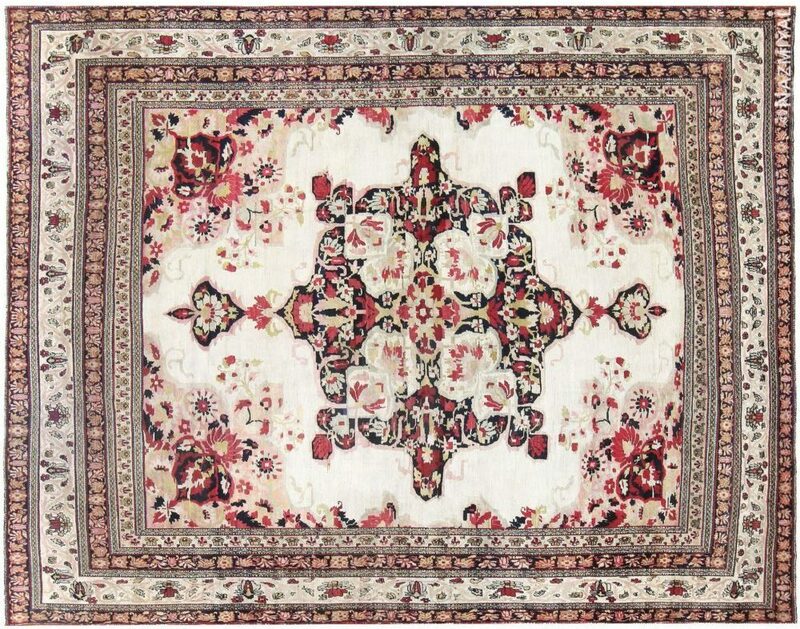 If you’re in the market for a rug, Nazmiyal Gallery is the best place to start. 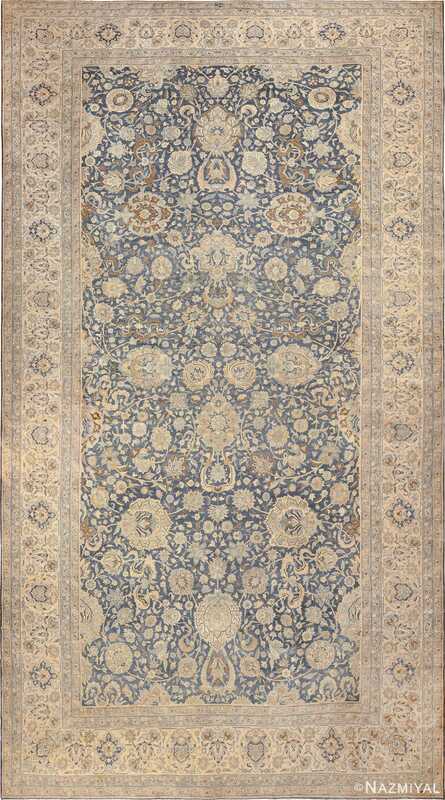 We have a vast collection of diverse Persian carpets and antique Oriental rugs in different sizes and styles, and you can look through this amazing collection of the Rugs and Carpets right here online. It’s a convenient way for you to find the next centerpiece to your room or a new addition to your collection. 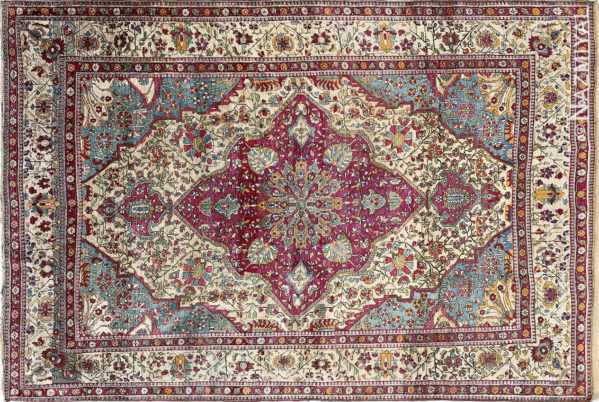 In addition to displaying our extensive inventory of Persian carpets, our website also contains useful information regarding these works of art for people who are new to this market. At Nazmiyal , we want all of our customers to feel like they are making a truly informed decision when it comes to purchasing Oriental rugs. You’ll find a lot of information on our site regarding the history of oriental rugs, maintenance guidelines and considerations to make when purchasing Persian carpets. If you would like to talk with one of the experts at Nazmiyal, please feel free to give us a call at 877 784 3463. They’ll be able to guide you through our vast inventory of Persian carpets and help you find the type of piece you’re looking for. If you prefer, you can also contact us with your request by filling out the online form on the Contact Us page. We’ll promptly respond to your email with the information you’re looking for.